One of the perks of working in the yarn store is having first dibs on any freebies. 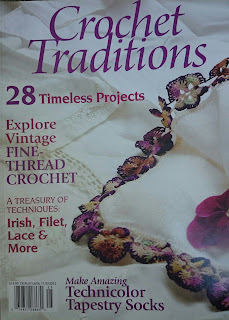 Hunting through a large box of old magazines on their way to recycling, I fished out the second ever (and final I think) edition of "Crochet Traditions", a 148-page special issue from PieceWork magazine from Fall 2012. I love to read about traditional stories, projects and techniques and feel quite passionately that we must preserve them ALL. I can't understand why this was discontinued because it's a fantastic read! I recognized two crochet industry rockstars among the contributors which is always a good sign when reading a magazine that you're unfamiliar with. Doris Chan and Carol Ventura are widely renown respectively for their lace and tapestry crochet techniques. I've had a little foray into both in recent years. My Craft Yarn Council master teacher and mentor Barbara Van Elsen, who I'm always talking about, suggested I look into Irish Lace. The first section consists of SEVEN articles all about Irish Lace - what joy! 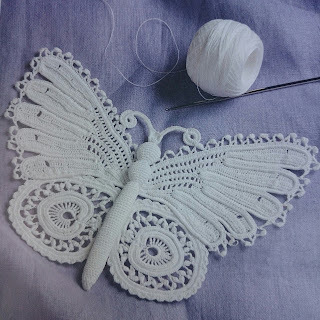 Just look at this exquisite Irish Crochet Butterfly by Nancy Nehring. The tiny size of the hook and size 10 thread are a little daunting but I certainly can appreciate the level of skill involved in undertaking such a project. The digital version is available at the Interweave Store. The projects are definitely for the more proficient but I guarantee that even if some of these patterns are beyond your skill level you will definitely enjoy reading about them as I did. This one will stay on my shelf ad infinitum.